A VPN browser extension is a lightweight and handy way to connect a web browser like Chrome, Firefox, Safari, or Edge to a VPN server. The VPN connection encrypts all of the data going to and from your web browser, and then routes it through the server, hiding your location and IP address. Most VPNs require either making manual changes to your device settings or downloading and installing an app on your operating system. Instead, a VPN browser extension is a simple plugin that you can turn on and off while surfing the web. Note that we use the terms “plugin” and “extension” interchangeably. VPN browser plugins do come with a catch, though: they only protect your web browser, and not other apps or services on your device. Other apps, games, and tools will still use a direct, unencrypted internet connection. If you want to protect them, you’ll need to install a native VPN app. Luckily, all of the VPN providers we recommend in our list of the best VPN browser extensions also come with native apps for Windows, MacOS, iOS, Android, and more. Sign up with a VPN provider from the list below. Download and install the extension from your browser’s official store or from the VPN provider’s website. Open the extension and log in. Select a server and connect. The NordVPN browser extension encrypts your browser’s web traffic and replaces your device’s IP address with one of NordVPN’s 5,200+ servers in 60 countries. The extension also blocks ads and malware. Users may choose a specific location or simply click Auto connect to select the best server nearby, but they do not have the option to select a specific server as they do with the desktop app. The plugin includes an option to disable WebRTC, a protocol that can expose your real IP address even with a VPN connected. NordVPN boasts excellent privacy and security standards and is great for unblocking geographically restricted content like Netflix, Hulu, and BBC iPlayer. The NordVPN browser extension is available for Chrome, Firefox, and Firefox for Android. ALL-ROUND FAVORITE:NordVPN's plugin is a powerful yet easy way to protect your browser and access blocked content. 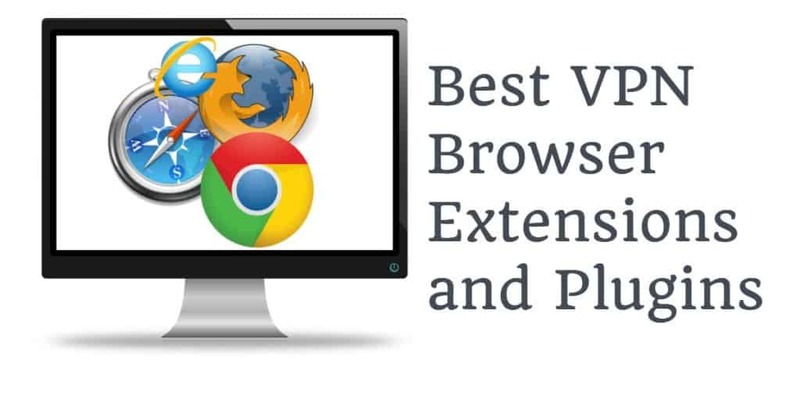 ExpressVPN’s web browser extension works differently than others on this list because it is not a standalone product. Instead, you must have the native VPN app already installed on your system. The browser extension remotely controls the native VPN app. The benefit is that your device is always fully protected, even if you close out of the web browser. You can choose from a list of server locations in 94 countries or choose Smart Location to automatically select the best server nearby. ExpressVPN hosts servers that can unblock Netflix, Hulu, and BBC iPlayer, among others. Like NordVPN’s extension, ExpressVPN’s plugin comes with the option to prevent WebRTC leaks. However, instead of just disabling WebRTC, ExpressVPN changes the network path so WebRTC traffic goes through the VPN server, and your IP address is never exposed. A kill switch and DNS leak protection are built in, as is HTTPS enforcement, which opts for HTTPS-encrypted versions of websites whenever available. ExpressVPN’s browser extension has been audited by a third-party cybersecurity firm, and all the code is open source. Furthermore, the extension scrambles the location reported by Google’s geo-location API and HTML5 geolocation, browser features that can be used to track your location. Once connected, your reported location will be a random location within a certain distance of the VPN server. The ExpressVPN extension is available for Chrome, Firefox, and Safari. ADVANCED PROTECTION:ExpressVPN's browser extension offers privacy and security benefits not found in any other VPN plugin. The Ivacy browser extension easily unblocks a slew of popular streaming channels including Netflix, Hulu, HBO Now, and BBC iPlayer. Along with all the usual benefits of a VPN, you get WebRTC protection. Choose from more than 50 server locations or use the Smart Purpose Selection to get a connection tailored to your needs. Ivacy offers great security, a no-logs policy, and fast servers. The Ivacy plugin is available for Chrome and Firefox. GOOD FOR STREAMING:If you need a VPN browser extension that unblocks everything, Ivacy is an excellent choice. The SaferVPN browser extension gives you all of the service’s standard features in a lightweight and easy-to-use plugin. That includes access to all 700+ servers, 24/7 in-app support, and great speeds. Once installed, it takes just one click to get connected. A free version is available if you’d like to test it out, but you only get 500MB of bandwidth per month–barely enough to scroll through Facebook a few times before you’re cut off. SaferVPN boasts some of the fastest servers we’ve tested, a super simple interface, and rock-solid security. It unblocks Netflix as well as a handful of other popular streaming sites from abroad. The plugin is available for Chrome and Firefox. EASY TO USE:SaferVPN will have you up and running within minutes of signing up. CyberGhost shuttered the free version of its native VPN apps, but the browser extensions are still available at no charge. Note that CyberGhost says “this browser plugin is not secure when accessing Flash content and does not protect you from webRTC leaks.” For full protection, you’ll need the paid subscription and the native desktop or mobile app. The plugins were built on the Ethereum blockchain, which CyberGhost claims guarantees your data stays private. You get unlimited traffic, but as with any free VPN or proxy, that doesn’t mean unlimited bandwidth. CyberGhost says you probably won’t be able to unblock streaming channels with the extension. Furthermore, only four locations are available: Germany, Netherlands, Romania, and the US. The CyberGhost VPN Proxy extension is available for Chrome and Firefox. UPGRADE AND SAVE:If you buy a CyberGhost subscription, you’ll get a ton more servers to choose from and can unblock lots of sites like Netflix, BBC iPlayer, and more. What about free VPN browser plugins? There are plenty, but the vast majority are not worth a second look. Free VPNs usually impose data caps, bandwidth limits, and waiting queues on users, making it a slow grind to do anything other than basic text-based web browsing. You also get fewer servers to choose from, and those you do connect to are often congested by other free users. Even free VPN providers need to make money to pay for server upkeep and other overhead costs. Their business models often entail siphoning off the personal details and browsing activity data of users, which can then be sold to advertisers. This contradicts the whole point of using a VPN in the first place: to improve online privacy. Finally, free VPNs are sometimes fronts for spreading malware. Browser extensions are certainly no exception. Plenty of malware has found its way onto the Chrome and Firefox storefronts. In short, it’s best to stick to paid providers. Your peace of mind is worth a few dollars per month. There’s some debate about whether VPN browser extensions actually constitute VPNs. In fact, most of them are HTTPS proxies. Only data sent to and from your web browser goes through the encrypted proxy. Internet traffic from other apps like Steam, Spotify, and your operating system are still sent through a direct, unencrypted connection. That includes DNS traffic, which can be used by your internet service provider to track your web history. If you want full protection for your entire device, consider downloading and installing a native VPN app. All of the providers we recommended above make apps for Windows, MacOS, iOS, and Android, plus a few others in some cases. These apps tunnel all the incoming and outgoing data from your entire device through the VPN server, not just your web browser. On a related note, steer clear of VPN browser extensions that don’t require you to log in. Extensions that allow anyone to connect don’t have a strong authentication process in place, which makes them vulnerable to attacks by hackers. 8 What about free VPN browser plugins?